Guns N’ Roses will launch their 2016 reunion with a pair of Las Vegas shows in April ahead of their appearance at Coachella. The reunited trio of Axl Rose, Slash and Duff McKagan will play the new T-Mobile Arena on April 8 and April 9 – just two days after its April 6 opening. A GNR Nightrain fan club presale is underway now and general public seats will go on sale January 23 at 10 AM PST. 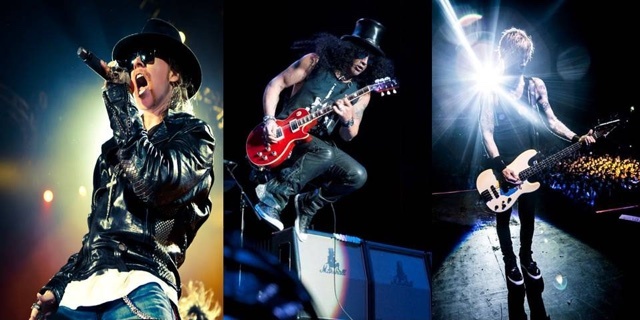 The shows will mark the first time the trio have performed together since a July 17, 1993 date at River Plate Stadium in Buenos Aires, Argentina. There’s still no official word from the GNR camp as to the remainder of the 2016 lineup, while rumors suggest a mix of the 1980s and most recent players is likely. GNR will headline Coachella on April 16 and 23 as part of the two-weekend event.